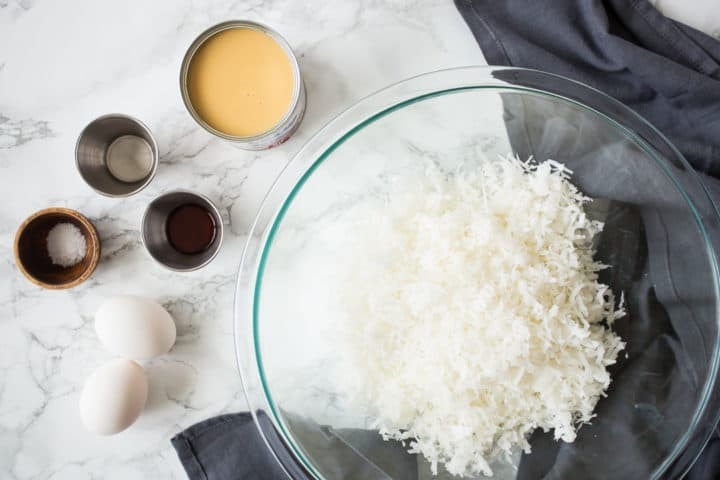 Learn how to make classic coconut macaroons that are crisp on the outside with a moist, chewy interior. Easy gluten-free recipe with just 5 ingredients. Right now I am all about spring treats like carrot cake cupcakes, lemon loaf, and pineapple upside down cake. These kinds of flavors just scream spring to me! Same goes for coconut. For some reason I always associate coconut with this time of year. 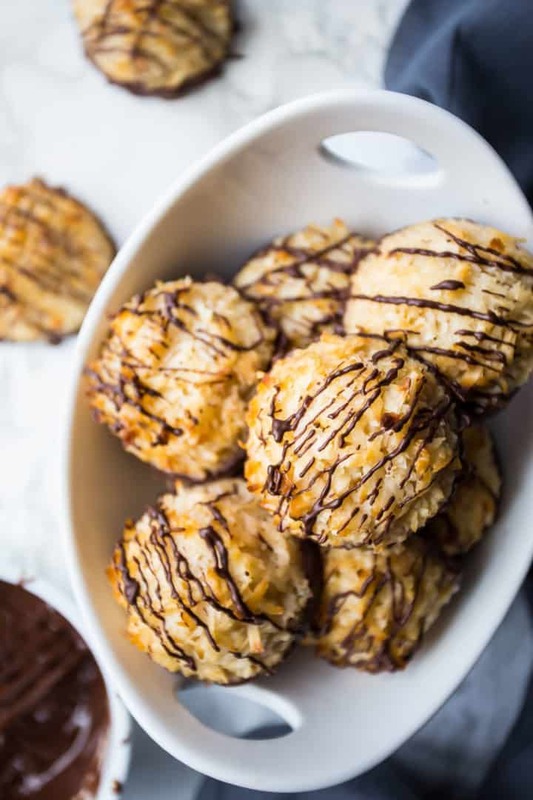 And nothing could be more iconic than classic coconut macaroons. They’re sticky sweet and so good. I especially love the kind you can get on the boardwalk at the shore. Big as your fist and so chewy and moist. They totally converted me from a coconut-hater to a coconut LOVER!! Bonus points if they’re dipped in chocolate. 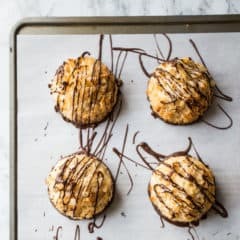 Before we get into the nitty-gritty here, I just want to quickly explain the difference between a coconut macaroon (note the 2 o’s), and a French macaron. It’s an easy mistake to call macarons “macaroons,” but they are two completely different things. French macarons are made with almond flour and meringue, and they’re sandwiched around a filling. 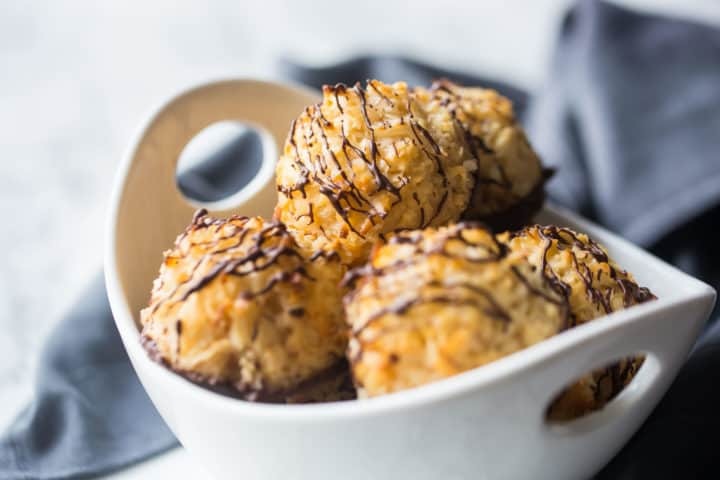 Macaroons are made with coconut and condensed milk. They’re naturally gluten-free and perfect for Passover. If you are looking to make macarons, I’ve got quite a few recipes. Just type “macarons” into the search window at the top of this site. Or check out this post; it’s a great starting point: Basic Macaron Recipe. WHAT ARE COCONUT MACAROONS MADE OF? 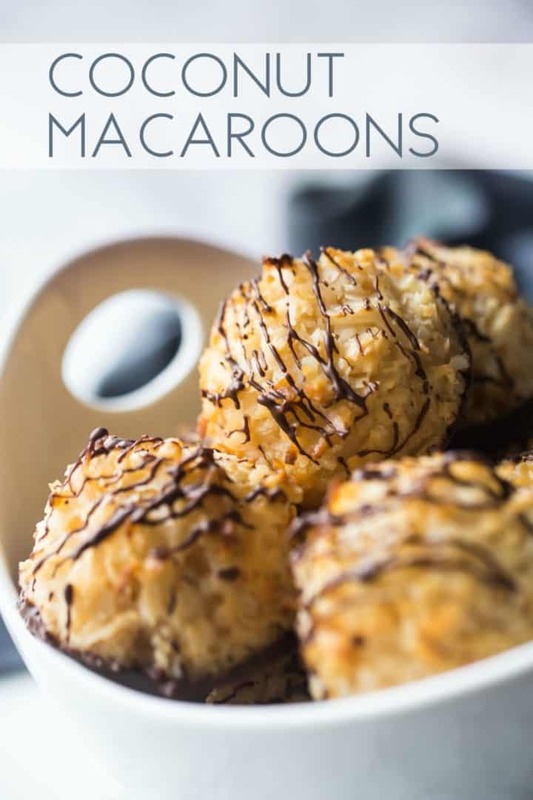 If you like macaroons that are light and a little crisp on the outside, with a soft, moist interior, then look no further! This recipe is JUST like the macaroons that you get on the boardwalk. 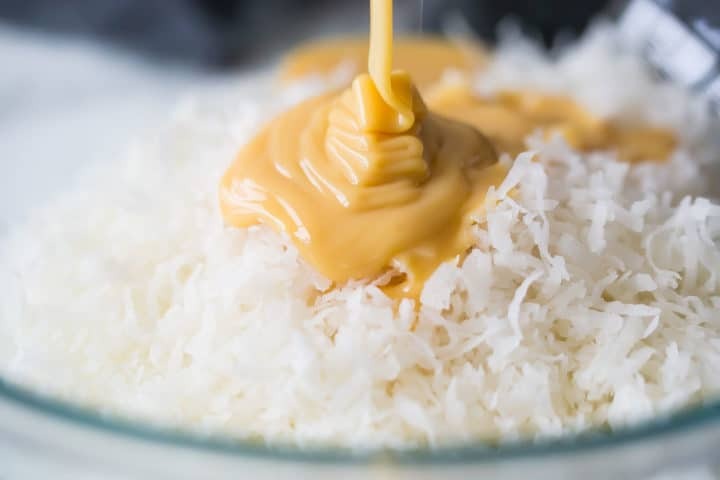 Start by placing the coconut, condensed milk, and extracts in a big bowl. You’ll need just a little more than half a can of condensed milk. Make sure you buy “Sweetened Condensed Milk,” and not “Evaporated Milk.” They are NOT the same thing! You want to stir in just enough condensed milk to make the mixture sticky, without it being overly wet. Add half the can at first, and stir in a little more at a time, until you get the right consistency. 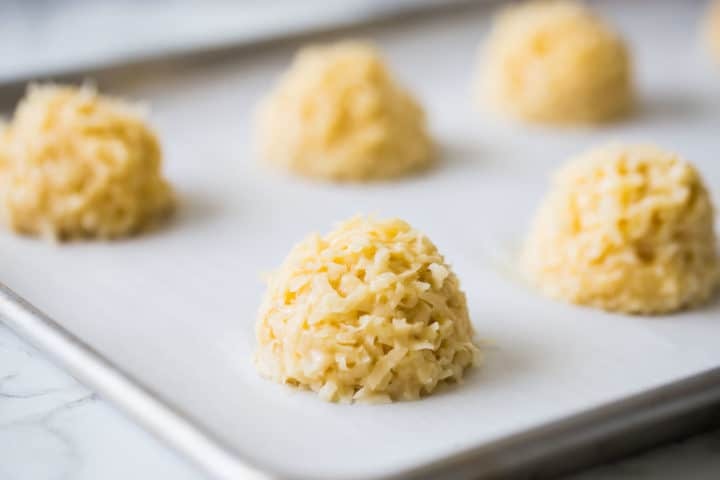 Not enough condensed milk will result in macaroons that are dry, and too much will cause your macaroons to spread too much and form a puddle of condensed milk around the base. Personally, I err on the side of slightly too much. It’s easy enough to trim the excess away from the baked macaroons with a sharp knife or round cookie cutter. But don’t go too crazy! Try putting condensed milk in your coffee! It’s SO good. 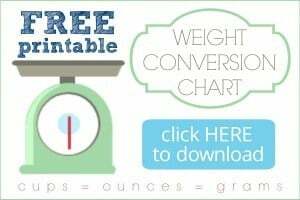 You can also use it to make no-churn ice cream, banoffee pie, fudge, or key lime pie. 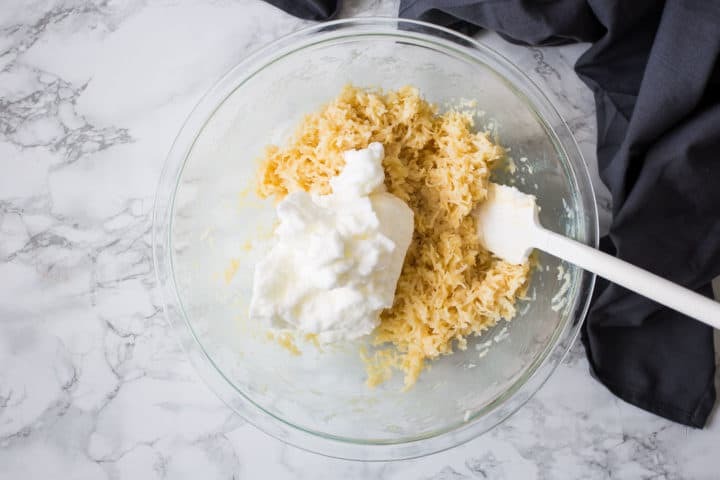 Once you’ve got the coconut, condensed milk, and extracts stirred together, whip the egg whites and salt together until nice and stiff. Add the whites to the bowl and fold everything together. You’ll notice the egg whites will make the mixture even more wet. That’s your coconut macaroon batter made! Pretty simple, right? 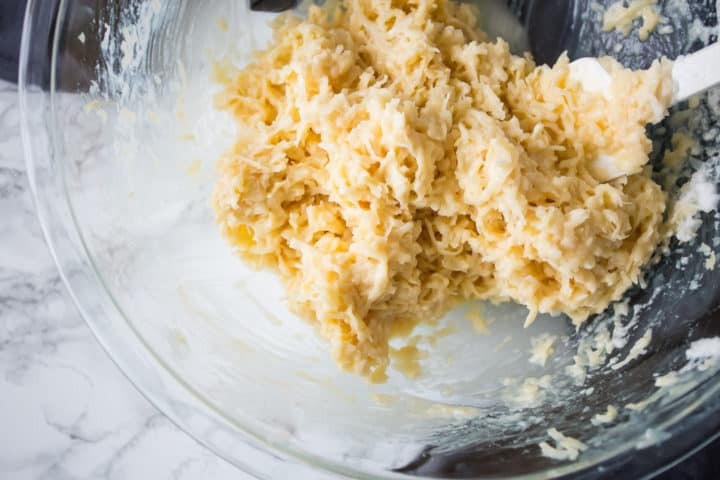 The best way to shape these macaroons is with a 1/4 cup scoop. I like to use this kind. Pack the batter in there tight as you can, and try not to have strands of coconut hanging off the sides of the scoop. Then press them onto a parchment-lined baking sheet. 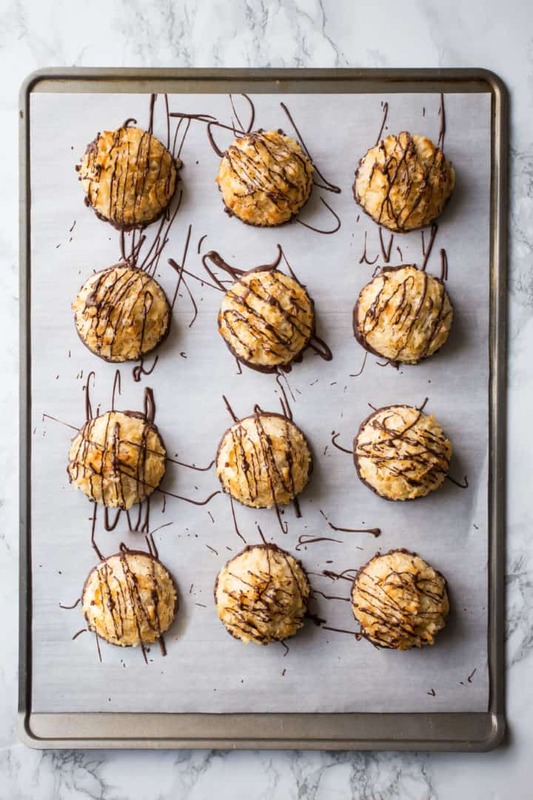 These coconut macaroons will bake at 325 degrees F for 28 to 36 minutes. You’ll know they’re done when they are starting to look a little golden. Once they’re cooled, try dipping the bottoms in melted dark chocolate, and give the tops a little drizzle as well. This is totally optional! But my husband loves them this way and I think it makes for an extra pretty presentation. Place these cookies in an airtight container, and they can be left out at room temperature for up to a week. After that, they can go into the fridge for another week or so. Macaroons freeze beautifully. They’ll last, tightly wrapped, in the freezer for at least a month or two. Thaw them at room temperature and they’re just as delicious as the day they were made! 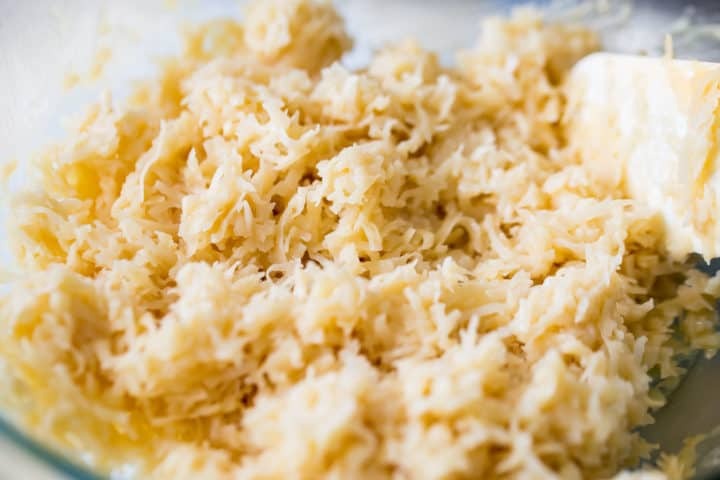 If you love coconut, definitely give this recipe a try! It’s got such a great flavor and moist, chewy texture. Bake up a batch or two for Easter or Passover! Preheat the oven to 325 degrees F and line a baking sheet with parchment. 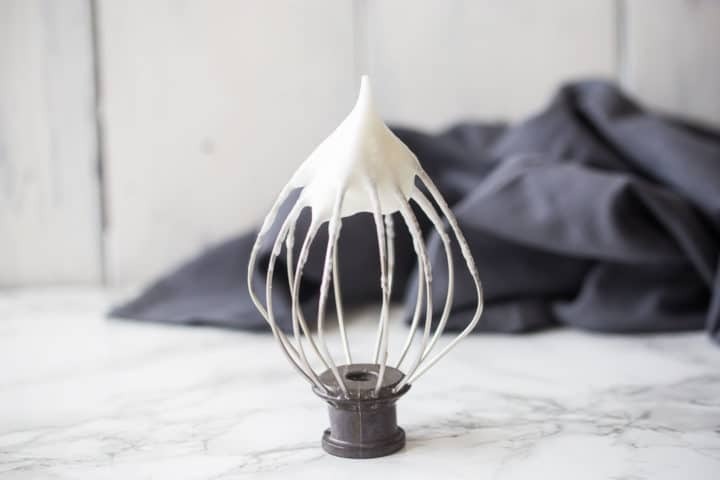 Whip the egg whites and salt together until they hold stiff peaks, and fold into the coconut mixture. Scoop 1/2 cup mounds onto the prepared baking sheet, and bake for 28 to 36 minutes, or until lightly golden. Optional: Dip the bottoms of the cooled macaroons in dark chocolate and drizzle additional chocolate on top. I haven’t made coconut macaroons in years so I thought I’d give these a whirl. All the recipes I’ve made from your blog have been successful and this one was no different. Simple, straightforward recipe and delicious results. These macaroons were bigger than I remember making, but they were so incredibly moist. Yes I’m going to use that word too because it just fits. And I’ll have you know…..I made the serious mistake of taking your tip on putting the extra sweetened condensed milk in my coffee this morning and…….thanks a lot Allie…..now I am hooked! I mean like seriously hooked. I don’t want anything else in my coffee ever again. I don’t know if I should thank you or hunt you down like a dog! LOL! Thanks for another great recipe and a new addiction. Haha! I’m laughing out loud over here Vicki! Thanks so much for the great feedback on the recipe and my apologies for creating a condensed milk coffee monster!